The Genaray MonoBright Daylight LED 1200 Kit was put together by B&H to give videographers light sources in a convenient form factor, with intuitive controls and access to the wide variety of light shaping tools available for the MonoBright's S-Type front accessory mount. The kit comes with 2 MonoBright LED 1200 lights, each with a reflector, diffuser, 10' air-cushioned light stand, and a wireless transmitter. Two Raya 32" Octa Softboxes with speedrings is also included for shooting people or products. With its monolight form factor, S-Type front accessory mount and AC or 12 VDC battery power options, the MonoBright Daylight LED 1200 fixture from Genaray can be easily integrated into a wide range of projects. The MonoBright employs a HiBrite 5200K microLED PCB to output the equivalent power of a 1,200W tungsten fixture while consuming only 100W of current. Its high CRI rating of >90 means that the light packs precision with power for faithful rendition of colors down to the subtlest tones. Another handy feature is the dimming range of 10-100% so you won't have to move the light once you have it perfectly positioned. And if you've mounted the MonoBright in a hard to reach place you'll appreciate the inclusion of a 2.4 GHz wireless remote control that can dim the light at distances up to 98' as well as turn it on or off. The MonoBright can run on 100-240 VAC mains voltage for worldwide use but the light also has a 4-pin XLR input for a battery cable and 12V battery (available separately). Also included are a 7", 60 degree umbrella/grid reflector, a spare fuse, and shower cap-style diffuser. The 32" OC-OSB80 Octa Softbox from Raya is an 8-sided light modifier supported by aluminum flexrods which are attached to the separately purchased Octa Fluorescent 7 fixture. The softbox features a highly reflective pebbled interior and a removable front face that attaches with simple touch-fasteners. It also has a detachable interior clip-on diffuser for additional soft light if desired. In use, it renders the signature wrap-around look that the modifier's shape is well known for, as well as natural circular catch-lights in your subjects eyes. This softbox is made to be used with the OC-OF7 Fluorescent 7 fixture and fluorescent lamps only. Featuring all metal construction and rapid bayonet-action installation, the Raya Speed Ring for SDR-400 Alpha Monolight is designed to quickly and conveniently mount the Raya OC-OSB80 32" or Impact FF-OSB60 24" Octa softboxes to the Raya SDR-400 Alpha Monolight or other Bowens mount strobe fixtures. The Raya SR-OCFF Speed Ring makes it easy to mount the Raya OC-OSB80 32" or Impact FF-OSB60 24" Octa Softboxes to the Raya SDR-400 Alpha Monolight and other similar Bowens mount fixtures. Compatible exclusively with these lighting tools, the speed ring offers hassle-free setup and takedown with quick attachment to your SDR-400's mount, or other similar Bowens mount fixtures. 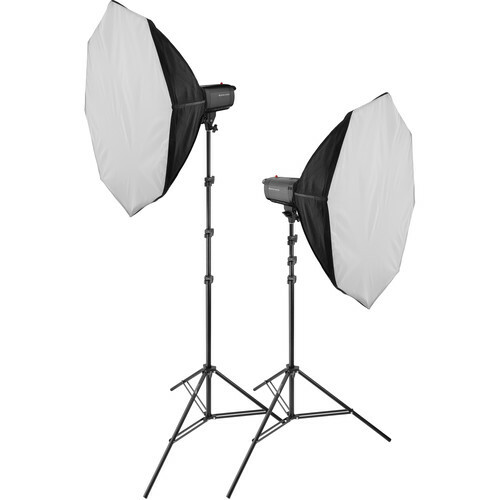 This allows you to create soft, diffuse lighting on location or in the studio. The SR-OCFF's durable metal construction insures reliable performance that can withstand the rigors of professional use. Box Dimensions (LxWxH) 18.0 x 13.0 x 7.0"
Box Dimensions (LxWxH) 20.5 x 7.65 x 1.75"
Box Dimensions (LxWxH) 6.6 x 6.5 x 2.0"
MonoBright Daylight LED 1200 Kit is rated 4.7 out of 5 by 6. Rated 5 out of 5 by Cosimo from Nice LED Lights ! These are a nice set of lights! Reasonably priced and what you see is what you get. They are very bright and I used them for a recent photo shoot with shoot through white umbrellas and the results were fine. Lights were true to color with the daylight balanced setting of 5000K. Light stands that came with the kit are a little flimsy. All in all its a great buy. The sales rep in the store was very helpful and knew his stuff and was a great help. Cant beat the service that you receive at B&H. Rated 5 out of 5 by Greg G. from best bang for buck monolight style leds I haven't tested a lot of different leds an these are the first I've ever owned besides the cheap AA battery powered leds and I must say this was the best purchase I made in awhile. PROS Price. Output. Ability to modify with Bowens accessories. Able to be battery powered with xlr 12v v-mount. Solid build quality. amazing for photography. The wireless remote is a God send. CONS The only REAL con is the fan noise, but given the tremendous value of these lights it is NOT that bad unless your trying to film very faint audio like footsteps, or water drops or any other audio that requires extreme silence. Many reviewers complained about it but if your filming interviews with a LAV mic I believe you'll be fine. I used 2 of the 100w daylight balanced lights to film a test interview on myself and I noticed the very little fan hum in the background. My key light was about 3.5 feet away and about 3 feet higher than my face and the other light was about 9 ft behind me acting as the hairlight. Only other small small con is there is an extremely small magenta tint i these lights. this can easily be corrected in Davinci by adjusting the Red channel one notch. Literally. And if your shooting RAW then this will not be an issue at all. Don't let the negative reviewers sway you away from getting these lights. if you did uour homework like me before I bought these, then look no further. Unless you need a builtin battery but get ready to spend about $1000 on an Aputure 300. Rated 5 out of 5 by Tzvetan from Very good lights and great dill Rrealy good lights for the money. What strength of Minus Green gel do you have to apply to these lights to get them to be a true 56K? 1/8 CTB will take you from 5200 -&gt; 5500k https://bhpho.to/2UuaX1d. No minus green needed. How hot do these lights get? Would you be able to use standard silver or white soft boxes or would you need to use a quartz or high heat option? They are digital lights , not hot; I have silver who are working very good. I don't advice you to use Quartz. They are very hot. this led light good for film shoot? Depending on your shoot, yes. Ive been very happy with these so far. Last week I shot in a room with open windows and a skylight in daylight and they still did the job. Very happy with these.